Fourth issue of Jonathan Maghen's L.A.-based conceptual graphics and arts magazine. This issue hosts a variety of international contributors from the fields of art, architecture, design, fashion and theory. Contributors include: AUDC, Becca Albee, Katherine Bernhardt, Anna Sew Hoy, Gwyn Porter, Prem Krishnamurthy, Marie Jan Lund, Francois Perrin, and many more. 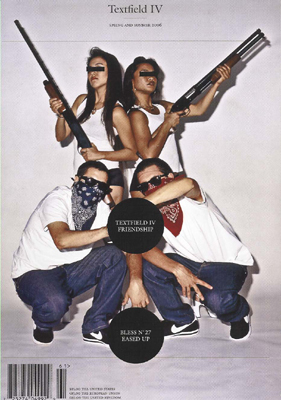 This issue was done in collaboration with Bless No27 Eased Up, which means that the last section of the magazine is also a Bless lookbook from their Fall 2005 fashion presentation. B&W, with full-color section, 112 pages, 6.5" x 9.5"